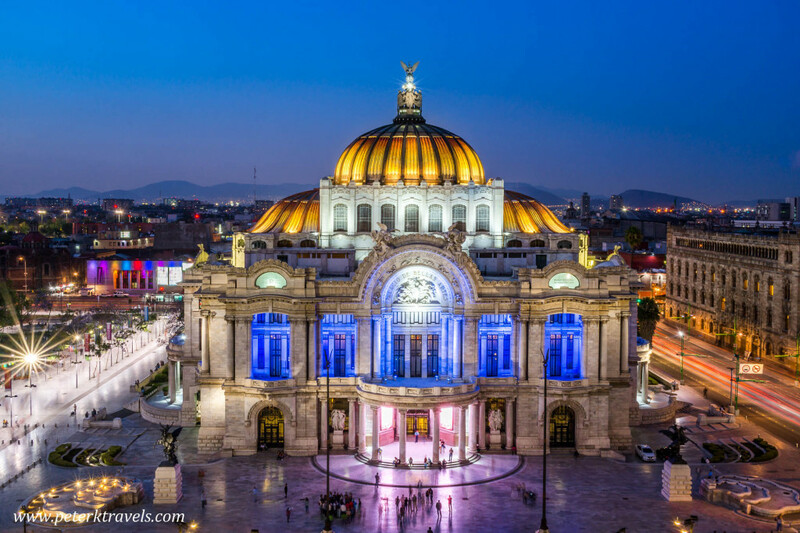 The Palacio de Bellas Artes (Palace of Fine Arts) is a Mexico City landmark. The beautiful building was begun in 1904, but not completed until 1934. The exterior is Art Nouveau, but the interior, completed later, is more Art Deco. The building houses a theater and gallery space. Murals by Diego Rivera, David Alfaro Siqueiros and others decorate the inside. I first visited the Palacio in 2016, and I enjoyed taking some early morning photos of the exterior, plus a daytime shot of the building from the Sears Cafe across the street. While the morning photos turned out well, I discovered the building is not lit throughout the night. The photo was less dramatic, relying only on early morning natural light. Returning to Mexico City in April 2017, I decided to try and get a nice night shot of the Palacio with its lights on. Shooting from the ground level was a possibility, but unlike the morning shot, I knew there would be crowds of people around the building and filling the plaza in front. Shooting the building from above would alleviate that, and I could probably work in some light trails from the traffic on the busy streets nearby. I decided to return to the Sears Cafe, which is on the 8th floor of the Sears Building across the street from the Palacio. It has an open-air area, so there’s no windows to contend with. I like to shoot during the “blue hour”, the time shortly after sunset when the sky turns a deep blue. Depending on the time of year, this period usually lasts around 30 minutes before the sky goes black, so it’s a short window to get the shot. On this particular day, I had from about 8:00 to 8:25. My wife and I walked to the Sears Cafe from our hotel, arriving at 7:45 only to find a line of people waiting to get in. We had time — but as the minutes ticked by, it started to feel bleak. Finally, shortly after 8:00, a group of people left, and we were admitted to the balcony. Unfortunately, there were no spots overlooking the Palacio, and I was getting impatient. My wife is a bit more patient than me. After a few more minutes, a couple stood up and left. As luck would have it, the seats they vacated were in exactly the right place, centered right on the front of the Palacio. We quickly claimed them. I unpacked my tripod and at its smallest extension, placed it on the counter in front of us. With the camera mounted, it just barely peeked over the glass barrier that extends up a foot or so. I was a little worried that I might be told that a tripod wasn’t allowed here, so I quickly fired off a few shots to make sure I had something. Thankfully, no one minded and I was able to spend about 15 minutes getting a variety of nice shots. I used a Sony fixed-lens 35mm point-and-shoot, and the focal length was just about right to center the building in the picture. Shooting in manual mode, I used a variety of shutter speeds — sometimes up to ten seconds — so that I could get light trails from car tail lights. So, finally, here’s the shot — well worth it, and my favorite from the trip. 3 Responses to "Getting the Shot: The Palacio de Bellas Artes"